Corporate 'bring your own device' trends, which see employees bring their own tablets and smartphones into the workplace, are on the rise, according to a new study. 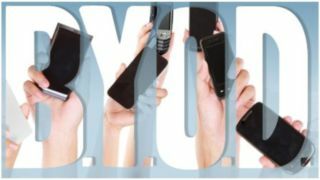 Ovum's 2013 Multi-Market BYOX Employee Survey found that nearly 70% of employees who own a smartphone or tablet choose to use it to access corporate data. The study surveyed 4,371 consumers from 19 different countries who were employed ful-time in an organisation with over 50 employees. The study has discovered that 68.8% of smartphone-owning employees bring their own smartphone to work, and 15.4% of these do so without the IT department's knowledge. Furthermore, 20.9% do so in-spite of a BYOD policy. Richard Absalom, analyst at Ovum, said: "Trying to stand in the path of consumerised mobility is likely to be a damaging and futile exercise. "We believe businesses are better served by exploiting this behaviour to increase employee engagement and productivity, and promote the benefits of enterprise mobility." Absalom told TechRadarPro that he expects typical usage patterns of BYOD behaviour to be higher among smaller businesses than their larger counterparts. He said: "For a start, consumers are employees, and businesses aren't really going to care what gear they use so long as they get their job done. It's a given that everybody has a smartphone that they take to work, which helps build up the business and helps people do their job." However, Absalom warned that small businesses face security and management issues if they fail to properly manage employees' devices in the workplace. "Whatever sized business you are you don't want data to go missing, but data loss for small businesses could spell the end in terms of legal and reputational costs if core IP goes missing," he added. "It's in businesses' best interests to explore freemium offerings out there, such as mobile device management launches that offer a basic free product and then try to get you to buy into it."